The N.C. Chronicles. : Why Don't Feminists Fight for Muslim Women? With the west running away from the radical left politically, many has realized they where never for the rights of others, but for personal power and financial gains, (which we have pointed to on many occasions). Feminism is no different, if not the main reason why the west is in such a mess. The demonization of men and traditional families, not to mention the stay at home mom which some describe as slaves to their husbands even when these women have made a well though out choice to care for their families by staying home. The idea some of them promote or ignore the abuse of muslim women who are forced into the backwards sharia laws, where the video above carefully dissect the true nature of such a law, the control of women's freedom to be who they wish to be, is nothing more than dictating how women should behave, obey, even dress to please those who want to bring the past into today. 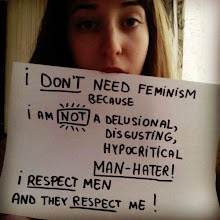 By keeping silent about this issue, they have shown their true nature and that's why feminism is on a path to oblivion, their hypocrisy is so obvious that women have awaken to their self serving hatred of anything traditional and things that don't serve their twisted views of an illogical idealism. One thing is for sure, women have realized their freedoms depend on co-operation with men, together is how we advance, without been grouped into small circle where it's easier for organizations like radical feminism to divides and benefit from said divisions. Their time has coma and gone, if it was ever there to begin with. In order to leave a better world to the next generation than we had, siding with radical idealism like feminism has slowed our development because thanks to them and groups like them we are more busy with words than end with ism and phobia, and fighting with each other...people have been made so scared to be called names if they speak their minds, they don't realize their silence gives a chance for devolution to flourish. So why don't these radical feminist fight for muslim women?? Because taking the issue on, would not be...financially beneficial. This is not western values and if anything, though not perfect, they should be advanced and protected, after all, haven't we made our surroundings better than any other system? And if we bow to tribalism, like feminists, sharia law, and other idealism, aren't we slowing down our evolution by going backwards? The N.C. Chronicles does not condemn anyone's beliefs, if it fits your style, so be it, but do not try to "impose it".